Within the Department of Mechanical Engineering and the Wisconsin Institute for Discovery at the University of Wisconsin–Madison, Turng studies areas that include injection molding, microcellular injection molding, nanocomposites, biobased polymers, and tissue engineering scaffolds—and this research is redefining the future of polymers in industry, the environment, and public health. Born and raised in Taiwan, Turng received his bachelor’s degree in mechanical engineering from the National Taiwan University with a minor in manufacturing, and his master’s and PhD degrees from Cornell University. At Cornell, he worked in the Cornell Injection Molding Program (CIMP). 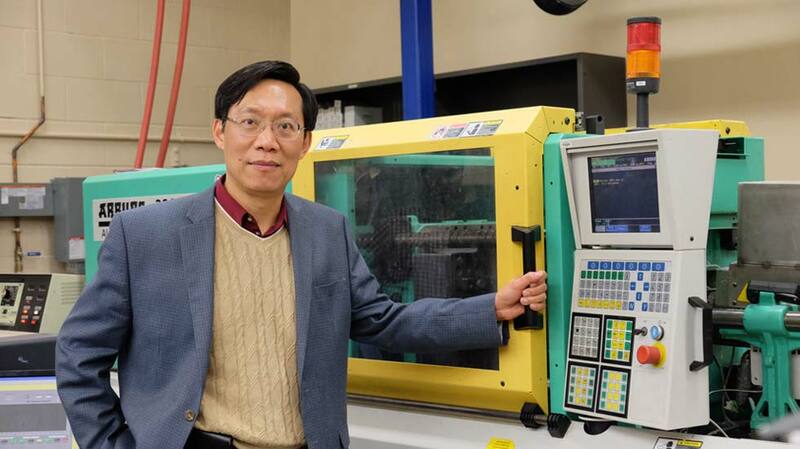 He also worked in industry, developing advanced plastics injection molding simulation software and a knowledge management system for 10 years before joining the University of Wisconsin–Madison in 2000. At UW–Madison, Turng chose to work on microcellular plastics. His research spans three distinct fields, as shown below. Microcellular injection molding is a process that produces dimensionally stable and lighter weight plastic products featuring numerous microscale voids that reduce part weight by replacing plastics with gas. This manufacturing process uses less energy, offers additional design freedom, and costs less to make and ship. Products produced with these qualities are highly sought after in the aerospace, automotive, business equipment, and sporting industries, and have found emerging applications as mass-produced tissue engineering scaffolds with an interconnected pore structure and complex geometry. One thousand times thinner than a human hair, nanoscale fillers are incorporated into certain types of polymers to improve their mechanical properties, rigidity, and electrical conductivity, and in some cases, to retain transparency in the final product. These nanoscale fillers also serve as nucleating agents, helping to enhance the microstructure and mechanical performance of microcellular injection molded nanocomposites. The tunable physiological properties of nanocomposites also render them perfect candidates for a wide variety of advanced applications including tissue engineering scaffolds for matching properties with host natural tissues. This research deals with plastics made of sustainable and renewable resources (like corn starch or agricultural byproducts) or natural polymers and then improves their performance through blending and compounding. Depending on the type of plastic and composting conditions, these plastics can be customized to biodegrade over a certain period of time. In addition to being great materials for packaging applications and compostable agricultural products, the biodegradability and biocompatibility of biobased plastics/composites gives them great potential in biomedical applications.